Your Health And Food Friend | Your Health And Water Friend | Cover Page | It's All"In The Blog"! ...When we become physically ill or have an injury, we are generally quick to respond. We take over the counter medications, apply cold compresses, take vitamin C, and seek out medical attention, if needed. In general, we also take steps to ensure ongoing good physical health when we are feeling fine. We try to eat right, take vitamin supplements, get enough sleep and incorporate activity and exercise into ..."
can have an impact on the health of your organs. If the energy flows through your body smoothly, then your organs stay healthy. If the energy gets blocked or there is too much energy in one part of your body, dis-ease can result. Basically, dis-ease shows up in the human energy fieldbefore dis-ease shows up in your physical body. Something else that is interesting to note is that each organ operates at a particular frequency.If an organ vibrates at a frequency that is lower than normal for it, dis-ease results. First-year college students' self-ratings of their emotional health dropped to record low levels in 2010, according to the CIRP Freshman Survey, UCLA's annual survey of the nation's entering students at four-year colleges and universities. The survey, part of the Cooperative Institutional Research Program (CIRP), is administered nationally by the Higher Education Research Institute (HERI) at UCLA's Graduate School of Education & Information Studies. Only 51.9 percent of students reported that their emotional health was in the "highest 10 percent" or "above average," a drop of 3.4 percentage points from 2009 and a significant decline from the 63.6 percent who placed themselves in those categories when self-ratings of emotional health were first measured in 1985. Female students were far less likely to report high levels of emotional health than male students (45.9 percent versus 59.1 percent), a 13.2 percentage-point difference. Women were also more than twice as likely as men to feel frequently "overwhelmed by all I had to do" as high-school seniors. While students' perceived emotional health took a downturn, their drive to achieve and their academic abilities are trending upward. More students than ever before (71.2 percent) rated their academic abilities as "above average" or in the "highest 10 percent," and 75.8 percent rated their drive to achieve in the same terms. Often considered positive traits, high levels of drive to achieve and academic ability could also contribute to students' feelings of stress, said John H. Pryor, lead author of the report and director of CIRP. levels of poor judgment around time management, alcohol consumption and academic motivation." The challenging economic landscape continues to influence students' college experiences. The proportion of students using loans to help pay for college remains high, at 53.1 percent, and more students reported receiving grants and scholarships than at any point since 2001 — 73.4 percent, a 3.4 percentage-point increase over 2009. "The increasing cost of higher education poses a significant barrier to college access for today's students," said Sylvia Hurtado, co-author of the report and director of the Higher Education Research Institute. "Students and families are now charged with the task of becoming more resourceful and strategic in finding new and creative ways to pay for college." The survey documented the continuing effect of the economy, with unemployment on the rise for students' parents. The percentage of students reporting that their fathers were unemployed (4.9 percent) was at an all-time high, and the percentage reporting unemployed mothers (8.6 percent) also continued to increase. Students are weighing their preferences along with considerations regarding the net costs of attending particular colleges. The survey also revealed that an increasing number of students are focused on the value that a college degree confers. In fact, more students than ever before (72.7 percent) indicated that "the chief benefit of college is that it increases one's earning power." This belief is in line with policy makers' efforts to advocate for pubic investment in higher education as a means to stimulate the economy. "I am heartened to learn about students' overwhelming support for extending equal rights and dignity to gays and lesbians," said Carol Schneider, president of the Association of American Colleges and Universities. "Students' willingness to engage different perspectives and experiences is a virtual precondition for their own intellectual development in college and one of higher education's most important contributions to the future of a just and diverse democracy." Economic concerns also seem to have influenced students' political views. An overwhelming 64.0 percent of students agreed that wealthy people should pay more taxes than they do now. This figure has been on the rise since 2002, when it was at 50.1 percent. Nearly one-third of students agreed that "The federal government should raise taxes to help reduce the deficit," the highest percentage reported since this question was first asked 25 years ago. On this particular issue, students' opinions differed according to their political orientation. Students who considered themselves liberal were twice as likely to support raising taxes to reduce the deficit as those who identified as conservative (45.7 percent versus 21.2 percent). More than three-quarters of students support gays' and lesbians' right to adopt children. The 2010 Freshman Norms report is based on the responses of 201,818 first-time, full-time students at 279 of the nation's baccalaureate colleges and universities. The data have been statistically adjusted to reflect the responses of the 1.5 million first-time, full-time students entering four-year colleges and universities as first-year students in 2010. Since 1966, the first year the survey was conducted, more than 15 million students have completed CIRP surveys at 1,900 colleges and universities. The CIRP Freshman Survey is the largest and longest-running survey of American college students. 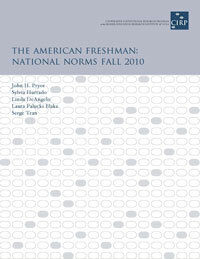 To view a summary or to order a copy of the monograph "The American Freshman: National Norms Fall 2010" (J.H. Pryor, S. Hurtado, L. DeAngelo, L. Palucki Blake and S. Tran), visit www.heri.ucla.edu. Emotional Intelligence, or EI, describes an ability or capacity to perceive, assess, and manage the emotions of one's self, and of others. Our EQ, or Emotional Quotient, is how one measures Emotional Intelligence. Is EI Important to Leadership Development and Performance? Research tracking over 160 high performing individuals in a variety of industries and job levels revealed that emotional intelligence was two times more important in contributing to excellence than intellect and expertise alone. Supervisors in a manufacturing plant received training in emotional intelligence competencies to help raise their EI skills in areas such as how to listen better and help employees resolve problems on their own, how to empower and inspire others, and how to become more effective personal leaders. the plant exceeded productivity goals by $250,000 (Pesuric & Byham,1996). The following chart depicts the number of times those individuals who became president or CEO displayed emotionally intelligent competencies, compared with those who were passed over. *Although those who became president or CEO showed cognitive competencies more frequently than those passed over, this difference was not significant. Can Profitability be Attributed to Emotional intelligence? Not only does emotional intelligence greatly contribute to job performance and leadership skills, it has also been found to increase profits. The following chart shows the relationship between emotional intelligence (EI) competencies with a high enough emotional quotient (EQ) to positively affect performance (based on 360 data), and the amount of profit generated at a multinational services firm per year per partner. As the chart shows, self-regulation appears to have the greatest impact on profit generation. Can you Increase your Emotional Intelligence and Emotional Quotient? How Can IHHP Help You With This? "...refers to a combination of conventional medical treatments and therapies, as well as alternative medical therapies. It uses the best of both approaches, usually starting with the least invasive, least toxic treatments. If these do not work to solve the problem, then more aggressive medical therapies are tried. This approach is sometime referred to as “CAM” for short. Treatment combinations for example might be something like drug therapy combined with acupuncture, chemotherapy supported by nutrition, or the use of ..."
" ...Colour is used in ways such as visualising certain coloured rays in treatment of a patient who is known to have a certain illness, etc. It can be used in the form of passing sunlight through panes of coloured glass or filters and by using coloured lamps. Another method used to obtain the colour for therapy is by putting water in coloured, clear containers out in the sun and allowing the sun's rays to pass through the coloured glass into the water, then the water is sipped. Leave the containers out in the sun for 2 hours only and bring them in before midday. Some healers like to use the visualised coloured rays only but some like to help keep the colour energies around the patient also by keeping the colour in the food they eat, the clothes they wear and the colour of their surroundings. "...I am so proud of my sister-in-law. She is doing such a wonderful job taking care of her mom. My mother-in-law is in the process of dying. My husband, our daughter and I are here at the house right now; and we were here last night for several hours. My sister-in-law, Lourie, phoned us yesterday to tell us that mom may not last the week, and then she said - possibly not the night. She lasted through the night and seems better today (that is a 'relative' better) - less congestion, better breathing. It seems that hospice didn't tell Laurie everything she needed to know to help. Hospice isn't communicating with mom's doctor. There should have been a suction machine ordered, and a nebulizer - for congestion. They gave Laurie mouth sticks, with the sponges on the end, to clear my mom-in-law's mouth out, when the congestion - (mucas) got too bad. Today the doctor said that she could ask hospice for a nebulizer and a suction machine. So that should be in the process of being ordered and coming to the house. Robert Dell should have been crushed. Two years ago, the meat-packing plant where he worked closed on a half hour’s notice. "Severance?" asks the blond, 47-year-old Dell, who is married with two children. "I got what was in my wallet." Within weeks he had traded in his butcher’s apron for a business suit. He then applied for a sales position at Metropolitan Life. "It never occurred to me that I didn’t know how to sell," explains Dell, who last year joined other top sellers in the Leader’s Club at Met Life. By most standards, Dell was an average Joe. He’d been punching time clocks for 26 years, as his father did before him. He hadn’t sold so much as a glass of lemonade when he was a kid, and when he took the standard insurance industry certification test, he barely passed. So how did Met Life recognize the supersalesman in the sausage stuffer? Dell possessed one trait that made up for everything he lacked: relentless optimism. Just before Dell lost his job, Martin Seligman, a psychologist at the University of Pennsylvania, had convinced Met Life to launch a highly original pilot program to hire new recruits. Management’s best predictor of success, Seligman argued, is the employee’s level of optimism. Met Life was intrigued, but wondered whether tests could really recognize and measure optimism. So Seligman sold them on his 20- minute written exam to identify upbeat people. Met Life used it to test 15,000 recruits – many of whom failed the industry exam the first time around. If these novice salesmen performed, the insurance carrier would agree to expand the program. Within months, the recruits were dramatically outselling those hired using the traditional way. Since then, Met Life has commissioned Seligman to sift through 20,000 other applicants to identify the optimists. By next year, Seligman estimates this new hiring practice to boost revenues $10 million. Seligman demonstrated that people tend to "learn" helpless and hopeless behavior after suffering a series of bad events. Later, he discovered that if you change a pessimist’s outlook on the events that befall him, you can help him become an optimist. Stable. Does a person see events as controllable? Or does he feel life is out of his control? Take two people whose investments in the stock market have just doubled. An optimist would call it a smart move, a success. A pessimist would say it's just a stroke of luck, like winning the lottery. If, on the other hand, a stock suddenly plummets, the optimist would deem it a fluke. To the pessimist, it could not have happened any other way. Global. The optimist feels his windfall is general proof that he's a success in life. He may sometimes even give the event more weight than it truly merits. But to the pessimist, it's just an isolated case of luck. With a bad event, however, the tables turn dramatically. Optimists dismiss each as an isolated occurrence, while for pessimists a bad event casts a dark, depressing shadow over their lives. Internal. Optimists shrug off the bad and internalize the good. Pessimists attribute the good to outside forces and the bad to themselves. Of course, there are times reality is so clear-cut that optimists and pessimists will give the same response. In years when the job market is tough, for instance, Seligman has found that both optimists and pessimists will cite the lean market as the cause of the hypothetical event, "You have been unsuccessful in looking for a job." At Met Life, Bob Dell doesn't get deflated by rejection. That allows him to push ahead with new prospects, his enthusiasm unabated. "This week I got a 'no' from a guy I'd been working on for three and a half months," he explains. "But I didn't get depressed about it. The client isn't rejecting me personally." In the next breath, Dell takes full credit for successful sales: "I have a good, substantial client list. I got it through prospecting, and I work very hard to maintain it. These people would never deal with someone they had no faith in. If I sell, it's because they're accepting me." His answers are absolutely consistent with his performance on the SASQ, though he can barely recall the questionnaire. Dell invariably separated himself from bad events, like rejections, but he instantly internalizes good events as proof of his skills and diligence and how well his life is going. Seligman's broad studies of explanatory style show the remarkable impact optimism has on achievement and well-being. Longevity. In a retrospective study of 34 healthy Hall of Fame baseball players who played between 1900 and 1950, optimists lived significantly longer. Good Health. Among 99 Harvard University graduates who were also World War II vets and have had physical examinations every five years since graduation, the men who were optimists at 25 were significantly healthier at 65 than the pessimists. Peak Performance. Seligman analyzed the explanatory styles of members of several professional baseball teams and found that optimists regularly surpassed expectations. That is, optimistic teams built momentum, developing a kind of synergy that helped them beat the point spreads. This makes a good case for staffing a company with optimists. Persistence. Pessimists give up, optimists persevere. In contrast to pessimists, Seligman found, even children who are optimists keep trying something until they master it. And these tendencies can last a lifetime. As adults in the work force, pessimists are twice as likely to quit their jobs as optimists. Risk taking. Because optimists have unflagging faith in their abilities, they're more likely to take risks. "It's not reality itself that's the problem," Seligman concludes from his studies. "We all suffer tragic realities, but it's how you see reality that makes the difference." We all interpret events and develop a point of view about life, which in turn colors the way we approach the future. This is why optimists like Robert Dell 'stay with it' and outsell others with a more pessimistic explanatory style. Met Life - along with hundreds of other companies have benefited - dramatically reducing turnover, improving performance and creating a more resilient workforce since implementing the SASQ. The results speak for themselves. Seligman had never intended to study optimists. Back in 1966, he developed a novel theory of depression. People, he felt, taught themselves to be depressed. They learned to feel helpless, out of control. In a series of studies, Seligman and his colleagues found that when rats were repeatedly exposed to painful and inescapable electric shocks, they'd stop struggling to get away. They "learned" that attempts to escape, they wouldn't even try. They would lie there as if they were helpless. For the next 10 years, Seligman searched for insights into "learned helplessness." He began to question why some people became pessimists while others resisted and didn't become helpless no matter what happened to them. That's when he started to investigate optimists. Then, on a flight to Philadelphia in 1983, John Leslie, an ebullient 60-year-old businessman, sparked Seligman's interest in business. "It was one of those airplane conversations," Seligman remembers. "I told him about my studies and he said, 'Have you ever thought of the applications to business? I'm talking about people who think they can walk on water.' Learned hopefulness. I'd never thought of that before." Leslie was right. Optimism does indeed have an impact on everything from business to war. By analyzing an explanatory style, you can help determine just how far someone's going to go. Take President Lyndon B. Johnson. Seligman found that Johnson's decisions during the Vietnam War were strongly foreshadowed by his explanatory style. Seligman analyzed 10 press-conference transcripts and found that the two made right after Johnson became president showed he had "an average explanatory style." But transcripts made right before the bold and controversial Gulf and Tonkin resolution and during the period when Johnson sharply escalated the war showed his explanatory style to be "wildly optimistic," which correlates with high-risk behavior. Later, in press conferences given right before his decision not to run for president again, his style had veered toward depression and passivity. Seligman's most controversial assertion is that explanatory style - which is simply a belief style - can be changed. Even depressed people can reshape their explanatory styles and learn to believe in their own power to mold the future. In a study of clinically depressed patients, Seligman discovered that 12 weeks of cognitive therapy (reframing a person's approach to the world) worked better than drugs because the change endured. "They were less vulnerable to depression the next time something bad happened," explains Seligman. Managers can use a similar process to nurture an employee's optimism. They can present alternative explanations for bad events. Their feedback can help people understand the cause-and-effect relationship between their efforts and results, good or bad. The message: They are in control of events that shape their lives. Constant reinforcement is important. How often? Anytime a manager talks to a subordinate. The process should become second nature. Consider how the founder of cognitive therapy, Aaron Beck, helped transform one woman's feelings of hopelessness. A first-year graduate student came to him with a paper from another psychology class after getting a C. She was discouraged and wanted to drop out of school. So they sat down and thought of some other explanations for the C. One interpretation was that she wasn't a bad student - the class average was a C - but that she just needed to work harder. When she called the professor, that was the explanation he gave. But can you change your style just by changing the words you use to explain events? That's where Seligman's theory takes the biggest leap, and where other psychologists take issue with him. According to Suzanne Ouellette Kobasa, a psychology professor in the Graduate School at City University of New York, whose studies on executive stress have been widely cited: "I don't think it's easy for someone to make a complete personality change. A basic shift has to occur first. You can't 'reprogram' a person unless he wants it." Indeed, says Seligman, it's far better for managers to hire optimists for positions with a risk of high rejection, such as sales. They tend to perform better. Seligman discovered they outsold pessimists by 37 percent in their first two years. For Richard Calogero, a management consultant at Met Life, the greatest benefit of optimism is its infectiousness. "We have a high turnover rate in this business," he says. "So the more optimists we have, the more pessimists we can convert. A bright future becomes of a self-fulfilling prophecy." At a recent insurance industry convention, Seligman's tests were the hot topic. Since then, over 50 companies have asked Met Life for more information on them. Curiously, Seligman has never used this theory to examine his own success. "I'm really blind to my own style. I could go back to my teenage diaries and analyze them," he says, "but frankly, I've locked the things up." Seligman doesn't want to know. But then, neither does insurance salesman Dell. Today he's thinking about just how to capture the sale that slipped through his fingers yesterday. Every thought and emotion you have constantly contributes to the state of your overall health. Scientists have now proven that being kind boosts your immune system. Can you believe it, isn’t that amazing? But of course we already knew that didn’t we? The body mirrors the mind perfectly; so what takes place in the mind, takes place in the body, thus the mind- body connection. When we experience an emotion, a chemical reaction takes place within our body. An emotion is felt and a corresponding hormone is released. For example when we feel stressed our body releases adrenaline into our system to help cope with it. Alternatively when we feel joyous our body releases endorphins which provide a sense of satisfaction and well being. It is this chemical release that connects the mind to the body and impacts our health. The chemicals released into our system attach to our cells by way of receptors. All cells have receptors and are therefore capable of connecting with the hormones from every emotion we feel. When the chemical attaches to the cell, it sends a signal into the cell that in turn creates a biochemical event inside the cell. Enough of the heavy stuff though, basically what that means is it changes the state of the cell and therefore changes you internally. We as human beings have an enormous array of emotions we feel continuously, whether we are aware of it on a conscious level or not. All emotions have a charge that we feel as positive or negative. Moment by moment we are releasing emotional charges into our bodies and most often unaware that we are feeling anything at all. In society as a whole, we have become so totally disconnected from our emotions. When we experience any of the positive emotions such as happiness, joy, passion, inspiration, harmony, trust, optimism, freedom, appreciation, empowerment, peace, enthusiasm, jubilation or love, our bodies are in a state of homeostasis which is physiological equilibrium within our bodies involving a balance of functions and chemical composition. Basically our whole body is in balance and we feel amazing. However reoccurrence of negative emotions such as boredom, anger, frustration, grief, disappointment, blame, worry, stress, loneliness, abandonment, sadness, fear, hate, rage, disillusionment, depression, anguish, resentment or guilt leave our body in a state of ill-health because of the way the cell is altered. From negative emotions comes a decline in our health. Negative emotions are toxic to our cells and therefore our whole body. For example when we suffer from too much stress in our body, we experience an enormous amount of cortisol which has a detrimental consequence on how we feel physically. We may encounter such symptoms as muscle tightness, back/head aches, liver dysfunction, sluggish bowels, fatigue, inadequate kidney performance and eventually may be a casualty of heart attack or stroke. Then we feel miserable physically, and consequently we feel negative emotionally and so you can see how the cycle can escalate. This is how dis-ease originates in the body. In a nutshell, the more you feel positive emotions, the healthier you will be! Your emotions determine your health and that is the bottom line. Think of a time you felt a negative emotion, how did your body react? Slumped shoulders, head down, tears, a sense of heaviness, shaking, tension, heart palpitations. This is how your body reflects your mind. What happens in the mind, happens in the body. I love what Louise Hay says in regard to skeptics of the mind-body connection; “Anyone who does not believe in the mind-body connection has never had a sexual fantasy.” Oh how she has the ability to get her point across. Think of how your body reacts to positive emotions; a sense of lightness, smiles all round, shoulders back, posture straight, glowing face, a full state of relaxation. Positive emotions allow us to feel good physically, mentally and emotionally. The more we feel good, the more we feel good. So here is a perfect reason why we would endeavour to live our life from a place of happiness. Yes, I know what you are thinking; we all encounter events and situations that provoke us to feel bad and I acknowledge it is all part of our human evolution. But this is where the desire for positive emotions is derived; us experiencing the polarity of the negative. To have the desire to be happy comes from knowing what it feels like to be unhappy. Having the desire for safety is from the feeling of being unsafe and scared. I am not saying you never have a negative emotion ever again, I am saying that we have the ability to take control and not fall victim to our emotions. When you feel a negative emotion there are a couple of ways to change how you feel. Firstly, acknowledging how you feel and being in acceptance of it will take the power away from it; and you will begin to feel it dissipate. Don’t ignore it or try to make it go away, this gives more power to it. So when you are feeling angry, acknowledge it and allow yourself to be angry rather than trying to push the anger away. Don’t punish yourself by thinking you shouldn’t feel a certain way, that will lead to repression of emotions. Acceptance of what emotion you are experiencing, frees you from feeling that way anymore and allows the emotion to move through you instead of being stuck in you; therefore allowing room for more positive emotions to enter. The acceptance of the emotion is already exchanging a positive emotion instead of the anger. Now your anger is gone, you can put your attention into a more positive effect. You can choose to feel positive about the same situation because you are seeing it through the eyes of a different emotion. Secondly, if you are still feeling powerless to negative emotions, it is vital that you release them by expressing yourself. Expression can be in the form of talking to someone about it or writing it down in a journal, either way, the emotion is leaving your body and that is what is needed here. Rid your body of the harmful emotion by expressing it fully by words or pen. Unexpressed negative emotions cause sickness in the body. They block the flow of energy and cause a buildup of toxic cells creating incessant fatigue problems, illness and disease. Long term emotional trauma stored in the body can cause serious disease such as cancer and the like. We repress our uncomfortable emotions in many ways including masking them by taking drugs (legal and illegal) or alcohol, overeating, excessive working, spending money (commonly known as retail therapy), obsessive sexual habits or even extreme exercising. These habits can turn into addictions and only serve to disguise the emotions within. These addictions enable you to numb the pain of the emotion so you don’t feel anymore. So many times we see an obese person lose weight only to regain it again because the core issue of why the weight was there in the first place has not been resolved. In some instances they may lose weight, keep it off, but will fall prey to a new addiction to seek the same numbness until they are willing to look within for the cause. This process is known as being detached from your emotions, although just because you are ignoring their presence, doesn’t mean they do not exist. They are still causing major toxicity from within. The sooner you attend to hurt in the past, the healthier you will be. If you are unsure of how to resolve past issues, seek advice from the experts. You may decide to leave bygones be bygones or sweep past hurt under the carpet so you don’t feel the pain of it again, but for the sake of your long term health and freedom of mind, resolution of emotional trauma is absolutely essential. Releasing past hurts is such a feeling of freedom and as I said before, it allows much more room to fill yourself up with the ‘feel good’ stuff. In my practice I have found that those who choose resolution of deep- rooted emotional pain are able to move forward with a new passion and vigor for life. They have the ability to paint their future with the brush of freedom because they have released what it is that has been holding them back. They are able to step forward with newly recreated dreams on a bigger and more abundant scale. Removing these self-sabotaging blocks allows processing on a physical, mental and emotional level all at once. It can also transpire at a subconscious level so you may not even be aware of what is being accomplished behind the scenes. So much can be achieved in a small amount of time. Years of cycling through the same patterns can be modified in a moment. Emotional potentiality is not a new concept for humanity to embrace; however being disconnected from it is the cause of the decline in our health. So how do we strengthen our immune system by being kind? When I heard Dr. Wayne Dyer state this, I was absolutely blown away because scientists have now proven what I have always felt in my heart. Whenever you give an act of kindness to another, the recipient encounters a strong emotion within. This emotion, as stated earlier, causes a chemical reaction inside the body by way of serotonin. Serotonin is the hormone that makes us feel phenomenal. So when someone gives you a gift, that welling up of emotion you feel inside is from the serotonin. It is this hormone that strengthens our immune system and therefore our state of health. But not only does the recipient increase their levels of serotonin, so does the giver because when you give in kindness, you also feel the emotional connection between the two of you and therefore release your serotonin accordingly. So you are both boosting your immune system at the same time. In this moment of kindness, the connection you feel is on a heart level, it is a connection of love between two souls. This is grace! But if that isn’t amazing enough, when an individual simply observes this act of kindness, they also feel the act of love and it boosts their immune system as well. So if you don’t want to be kind yourself, you can always just watch someone else do it and get the same result. So you can see where this is all going. Just by being kind, everyone around you benefits and gets a stronger, healthier mind and body. Wow, how awesome is that? So being kind and feeling good makes you healthy! So what you can do on a daily basis from a conscious perspective is to declare that you are the controlling factor in your health by seeing the positive instead of the negative; seeing the good instead of the bad. It is possible, but it is a choice, you can perceive things in a ‘feel good’ way. Tar you brush with the paint of love. Every single thing you encounter has an emotional reading to it. As the powerful human being that you are, you can override and change the way you think and feel about everything. Choose to see the endless beauty in situations, rather than the ugliness; face each day with passion instead of dreading what is in store. Embrace the opportunity to spend time alone and be out in nature rather than dwelling on the fact you have to mow the lawn, notice the beauty in the snake rather than feel the fear. See the love in everyone and know we are all connected by the Divine, infinite intelligence that we all embody within. ‘When you change the way you look at things, the things you look at change.’ – Dr Wayne Dyer. Permanent change means we need to abandon an old way of doing something and recreate a new and more effective way. Our common misconception is in believing all things happen automatically within our body. Now we have the understanding, knowledge and therefore the power to realise we are all in total control of creating our health. We now know how to give birth to optimal health. It originates from our state of mind and our wondrous emotions are the key. It doesn’t matter how well you eat, exercise and look after your body physically, if your cells can’t receive the nutrients and benefits because of emotional blockages, you will not become healthy for long. As you think, so shall you be. Mind becomes matter. So when you change your thought, you change the way you feel about any given situation. Thinking a positive thought enables a corresponding ‘feel good’ emotion. Raising your consciousness allows you to think and feel positively more of the time, naturally creating a healthy mind, body and soul. When your health is in an optimum state, the possibilities you create for yourself are endless. Change your thought, change your emotion and create the life you desire. Change your emotion, change your cells and be the complete and utter picture of health. ..."
Bodily function - the health of individual organs and blood flow. Even without the presence of pain or illness, you can see so much from the state of your body. At ease, the body's natural state is to be firm yet flexible with suitable tissue covering a well balanced bone structure. At dis-ease, the body becomes either frail and thin or rigid and fat which can then cause distortion of the bone structure. To find out more about what your body can tell you, go to Psychosomatic Healing. Until you experience it, intuition can seem like an abstract concept that only gurus can achieve. It's really not that way at all. But one thing is certain: listening to your intuition takes practise. Intuition comes into our awareness as a feeling. Many people make the mistake of thinking it comes as a direct, explicit thought in our minds. But intuition is more subtle as its language is emotion, not thought. This is why we call it our 'gut feeling'. The quandary arises when we need guidance from our intuition but there is no sign of a gut feeling. And most people don't know what to do next. There are practical strategies that we can apply that strengthen our connection with our intuition. One effective way to strengthen intuition is to be guided by what makes you feel good. It sounds impossibly simple but the soul communicates by triggering emotions - good or bad. When we are going in the right direction according to our soul's plan, we are happy and content. When we are not doing something that is in our 'highest good' (that is, when the soul 'approves'), life is a struggle and doesn't feel good at all. Without intuition, we struggle to find harmony in our body, mind and soul. I have been reading the book, On Grief and Grieving by Elisabeth Kubler-Ross and David Kessler. These passages in the book on tears resonate with me. i>"Tears are a symbol of life, a part of who we are and what we feel. They live in us and through us. They represent us and reside in our pain. This symbol of and representation of sadness can appear anytime." 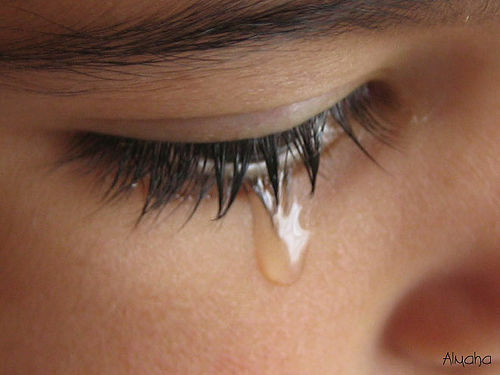 "Unexpressed tears do not go away; their sadness resides in our bodies and souls." "...Until you experience it, intuition can seem like an abstract concept that only gurus can achieve. It's really not that way at all. But one thing is certain: listening to your intuition takes practise. "...Female students were far less likely to report high levels of emotional health than male students (45.9 percent versus 59.1 percent), a 13.2 percentage-point difference. Women were also more than twice as likely as men to feel frequently "overwhelmed by all I had to do" as high-school seniors. ..." this article below.. When in love, your brain tends to focus affection towards a single person. No, this is not a cheesy discourse into the complexities of heartbreak. What I want to touch upon today is the science of love, that is, if science can say anything about this unique feeling of elation that often makes reasonable people do unreasonable (good and bad) things. There have been several studies of what goes on in the brain when someone is in love. A well-known one was performed by Helen Fisher — an anthropologist from Rutgers University, and collaborators in 2002-3. She has written many books and articles on the subject. Using functional magnetic resonance imaging machines (fMRIs) they analyzed more than 3,000 brain scans from 18 recently smitten college students. The images map blood flow in the brain. The idea is that whenever a certain part of the brain is active — the local neurons are buzzing — the flow of blood there is enhanced to supply oxygen. So, more blood means more action. Coupling this information with the specific details of where the action is happening, neuroscientists can actually pinpoint the most important chemicals being sprinkled during the activity spikes. In other words, the maps won’t tell you exactly what chemical is related to what feeling, but they can tell you what chemicals participate as the brain feels love. "... Foods that relieve inflammation. Lassi, A Delicious Probiotic "...The herbal lassi is truly a special lassi for people like IT professionals and high profile managers whose life time job is more of a brain work which needs a continuous free flow of oxygen to the brain through uninterrupted blood supply. "...you change your style just by changing the words you use to explain events? That's where Seligman's theory takes the biggest leap, and where other psychologists take issue with him. According to Suzanne Ouellette Kobasa, a psychology professor in the Graduate School at City University of New York, whose studies on executive stress have been widely cited: "I don't think it's easy for someone to make a complete personality change. A basic shift has to occur first. You can't 'reprogram' a person unless he wants it." Indeed, says Seligman, it's far better for managers to hire optimists for positions with a risk of high rejection, such as sales. They tend to perform better. Seligman discovered they outsold pessimists by 37 percent in their first two years. For Richard Calogero, a management consultant at Met Life, the greatest benefit of optimism is its infectiousness..."
Why should we develop our spirituality? Ideas for evoking a spiritual experience..."
A Julialanan Production Inc., LLC Est. 2010.